Last week was the first of our two Bill Koch League summer day camps and we had 24 kids from all over northern Vermont who joined us for a busy week of ski training and other outdoor fun. It was a great group of kids who were certainly not lacking in enthusiasm or energy! The coaching was split between all the GRP athletes and Craftsbury coach Jeremy Nellis and we were all pretty exhausted at the end of the busy but fun week. Monday morning the campers arrived and after some introductory games, half the group went rollerskiing while the rest played some soccer, capture the flag, and other games. On Thursday morning the other half of the group rollerskied. We had a wide range of rollerski experience levels from our CNSC BKL skiers who rollerski at least once a week to kids who were trying it for their first time. Dividing the group allowed us to cater to the different skill levels. The other half of the group skied later in the week. Craftsbury Common is the perfect place to learn with nice pavement and basically zero traffic. We went through quite a few bandaids with some minor spills but by the end of the morning everyone was skiing the slalom course and racing around on the skis. Annie and Weslie ski around a cone while Cormac comes in hot from the other side. Opposite directions through the slalom course adds an extra challenge! Everyone reconvened before lunch for some much needed swimming at the Craftsbury Outdoor Center waterfront. Monday was the hottest day so having access to the lake was appreciated by all! Lunch time games by the lake with James in the "pickle jar." Monday afternoon’s activity was canoeing. Some boats made it to Hosmer Point or even the other end of the lake but most stopped around the Narrows. With the afternoon sun glaring down and the heat continuing to rise, most kids spent more time floating in the water next to their boats rather than in the canoes. 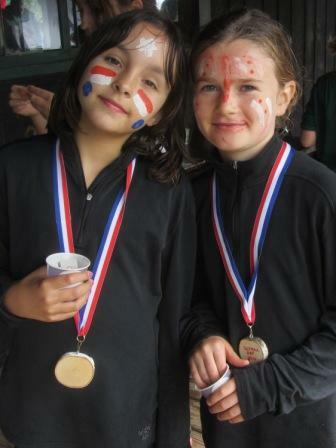 Tuesday was the rainy day of the week and the morning orienteering got off to a wet start. 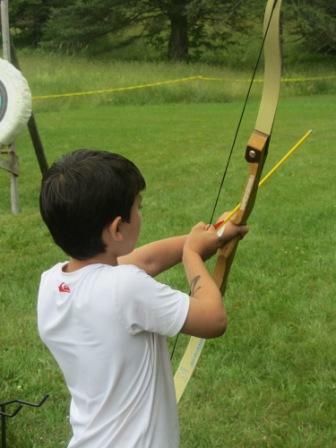 The center has an orienteering course set for the summer and the campers were challenged to get as many of its 30 points as possible. A few groups came really close to finding them all which meant they covered a lot of ground quickly across the ski trails, mountain bike trails, and even a little bushwacking. All the groups made it back to the touring center just before a big thunderstorm hit. Swimming was cancelled for the morning but the timing was perfect to wait out the storm inside while eating lunch. Luckily the skies cleared in time for mountain biking in the afternoon. The kids warmed up riding around the new pump track on the upper field and by the end of the session everyone was tackling the Center’s singletrack trails. The morning’s rain and storm made it a muddy adventure! Wednesday morning was a more ski specific session with ski walking, bounding, agility, and strength exercises on the new outdoor gym. Reid won the monkey bar contest and only stopped crossing the bars once his hands were too blistered to continue. Impressive strength! The morning culminated in a relay race and snacks in the shade of the solar panels. Thanks PowerBar for the snacks! 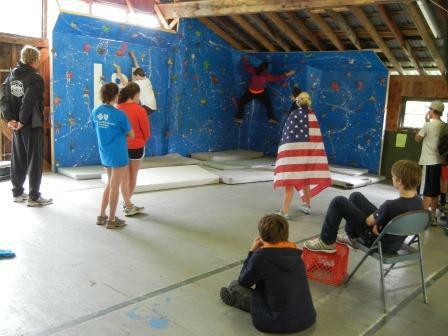 The afternoon sessions on Wednesday and Thursday included sculling and biathlon. 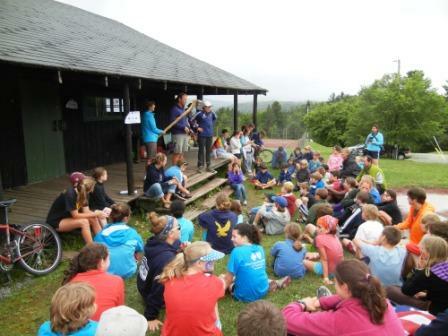 Each day half the group went to the lake where the Craftsbury GRP and SBTC scullers taught all the kids how to scull. Both days were quite breezy but everybody stayed upright in their boats! The other half of the group hiked to the biathlon range at Elinor’s house where Jeremy and Mike Gibson taught them how to shoot and staged some quick biathlon races combining running and shooting with penalty pushups. 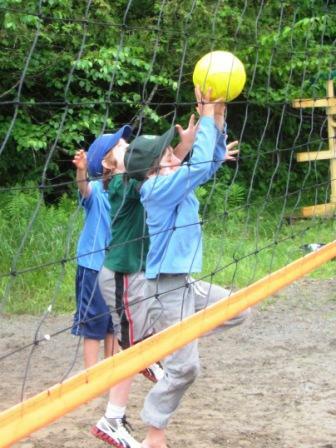 Friday was the culminating day of camp with lots of excitement. The day started with an adventure race. Dylan left watermelons floating in the middle of the lake which the campers had to rescue in canoes. The water leg was followed by mountain biking and running around the Outdoor Center, following a race course along the ski trails and single track. The watermelons were waiting for the teams to enjoy at the finish line. After a quick swim, everyone jumped on their bikes and rode a couple miles north along Lost Nation Rd. to the Dreissigacker’s cabin for the final afternoon party. Some of the campers who still weren’t tired added an extra loop to the ride and checked out the new pump track at Hosmer Point. When we arrived at the cabin, the pizza oven was hot and everyone made pizza, jumped off the ropeswing, and made quick work of lots of s’mores. Everyone contributed toppings for the group to share. Sam's choice was a bit more creative. Have you ever tried a Chex Mix pizza? We went through two bags of marshmellows, two boxes of graham crackers and LOTS of chocolate in a matter of minutes. Here's Nicole making her first ever s'more! A big thanks to Judy Geer for hosting the Friday afternoon party, the COC kitchen for making pizza dough, PowerBar for some great energy snacks, SBTC athletes for teaching sculling, Jeremy, Pepa, and all the GRP athletes for their coaching. It was a fun week and we’re looking forward to the next week of camp in August. On our active rest day this past Sunday, Lisa “The General” Schlenker took us on a nice 2 hour bike ride on the trails surrounding Craftsbury, with a few pit stops along the way. Kyle and I beat the heavyweights in the egg toss due to some athletic catches by Kyle, but after attempting a Hail Mary from one side of the animal pen to the other, we found the hand-eye coordination of our duo to be pretty one-sided. Active rest day: 1, Phil: 0. First, I’d like to announce a new addition to the Green Racing Project: Rowing! This blog will document the the exciting lives of the all new GRP Rowers both on and off the water, and will hopefully provide some insight as to what it is like to be living and training at the Craftsbury Outdoor Center. Nothing says “Welcome to Craftsbury” like 80 degrees, abundant sunshine and flat water in April! 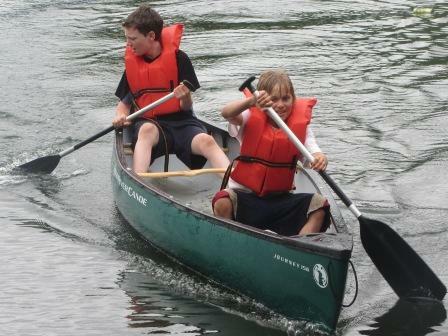 Despite the wacky weather, things have been going very smoothly for Craftsbury’s all new GRP Rowing program. Since this is our first post, I wanted to say a little bit about who we are, where we are, and what we are doing out here in the middle of the woods. The inaugural members of the program are Emily Dreissigacker, Kyle Lafferty, and Phil Henson. Emily and Phil both rowed for Dartmouth College and graduated in 2011. Kyle Lafferty was a 2010 graduate from Bucknell University, where he started rowing, and for the past two years has been working in Boston and training at Riverside Boat Club. Emily, Kyle, and Phil are all planning to race this summer – Emily in the single and Kyle and Phil in the lightweight pair. Check out the team bios for more info and flattering headshots! Craftsbury is located in what is called the Northeast Kingdom – a fitting name for this part of the country, with sprawling fields and scattered mountains. It’s a far cry from my hometown in New Jersey, scattered instead with deer and cul-de-sacs. The center itself is home to many running, mountain biking, and cross country skiing trails, and it is a stone’s throw from Mt. Mansfield, Stowe, Jay Peak, and other great hiking, climbing, and skiing destinations. It may seem odd to have a section here devoted to food but trust me (yes, I am a lightweight rower), it’s incredible! There is a big emphasis on high quality, healthy food with locally grown ingredients. The kitchen staff is extremely friendly and passionate about preparing the best food around. Just don’t forget to compost! Our role in this new GRP Rowing program is not only to try to get to the top level of our sport, but also to contribute to the center’s projects and long term goals. For example, we are working to develop an electric launch to potentially replace gasoline-powered coaching launches. There are also opportunities to work in the garden, on the trails, and in the kitchen. Original projects are encouraged, as long as they are in line with the mission statement of the center. This blog will be mostly about the goings-on of the year-round GRP Rowers, but since we train with the U23 SBTC athletes in the summer, the posts over the next few months will be more inclusive. We have less than a month until the London Summer Olympics begin and anticipation is building across the globe. 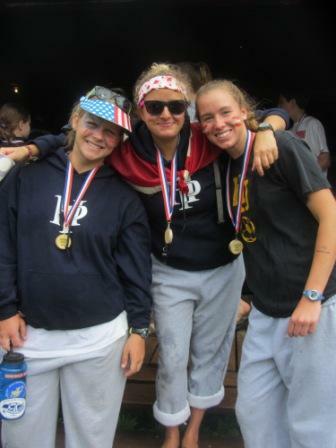 Last Wednesday, June 27th, we celebrated Olympic Day right here in Craftsbury, Vermont at Hosmer Point summer camp. 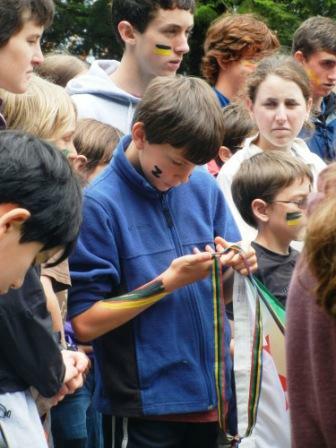 About 60 kids aged 9-14 participated in this free event that included marching in opening ceremonies, trying out a variety of Olympic sports, and learning Olympic trivia. Special guest Lynn Jennings, a 3 time Olympian and bronze medalist in the 10,000 m run at Barcelona ’92, lit the torch for us. Other guest athletes included cross country skiers and biathletes from the US national teams, the Craftsbury Green Racing Project, and the New England Nordic Ski Association’s Regional Elite training Group. Hosmer Point camp staff did an incredible job setting up, running the sports stations, and bringing lots of positive energy. Thank you Hosmer Point!!! 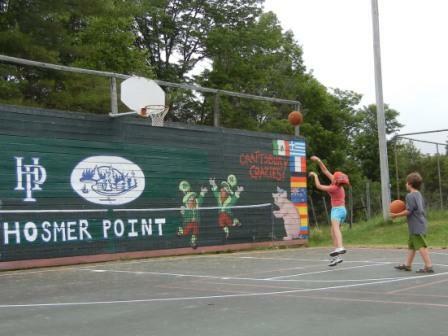 Welcome to Olympic Day 2012 at Hosmer Point! 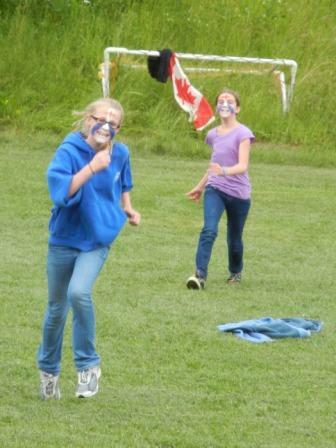 Olympic Day celebrates the Olympic movement and its ideals and promotes fitness and healthy living. It was celebrated in over 160 countries this year. 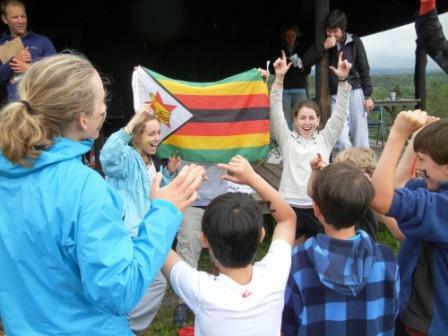 Kid participants and athlete helpers were divided into several groups for the afternoon representing different countries. 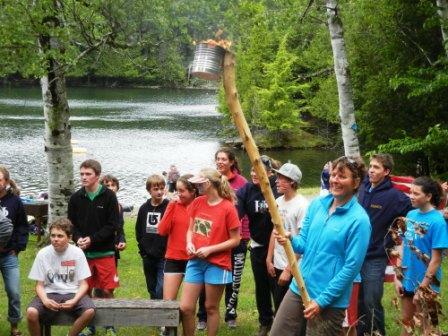 Lynn Jennings lit the torch and shared some of her experiences. She began running as a kid because it was simply something she loved to do. She encouraged the kids to follow whatever they felt passionate about and see where that thread takes them. Lynn passed her bronze medal around the circle. She says it always comes back to her, no matter how big a group she shares it with, but she also points out that the medal itself isn’t very important compared to the lessons and experiences she gained while pursuing it. After the opening ceremonies, the countries rotated through several sports stations. 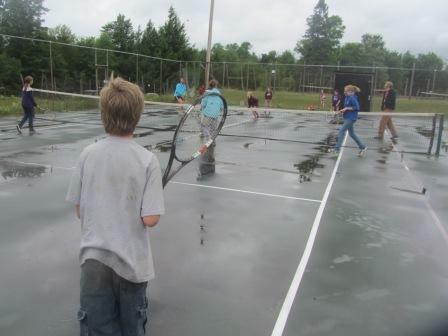 The day’s activities were not designed to be competitive. A few of the awesome Hosmer Point staff. 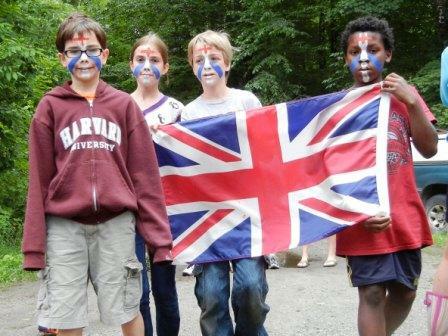 We are eagerly looking forward to watching the London Games. Go USA! And may competitors from all the different countries unite in their common love of sport.